The Center for Access to Football in Europe (CAFE) is marking its annual Week of Action between March 3 and March 11. This year's edition introduces a new initiative which invites football fans with disabilities to share their experiences attending matches in stadiums across Europe. 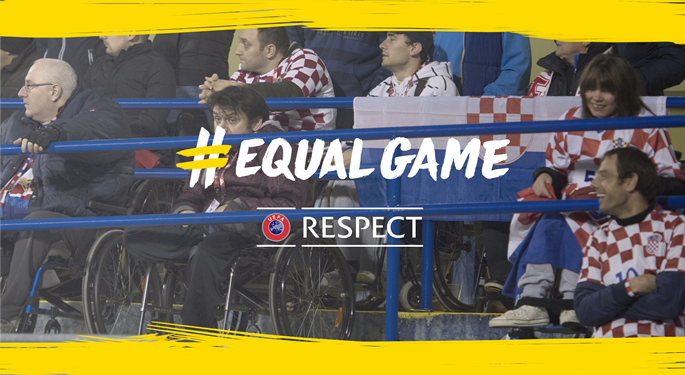 The main objective of the #ShareYourSightlines campaign is to show the varied experiences of disabled fans on different European stadiums, and to demonstrate the fact that movement, sight and/or hearing impairments do not have to stop fans from attending and enjoying matches. As part of the initiative, the Croatian Football Federation (HNS) and CAFE invite match viewers with disabilities to share two photographs: one of their view of the stadium, and another of themselves and their companions having fun at the match. Along with the images, HNS and CAFE invite fans to share a brief statement on why football is an important part of their lives and to use the hashtag #ShareYourSightlines. The images can be shared with with HNS via Facebook, Twitter and Instagram, and with CAFE via Facebook and Twitter.